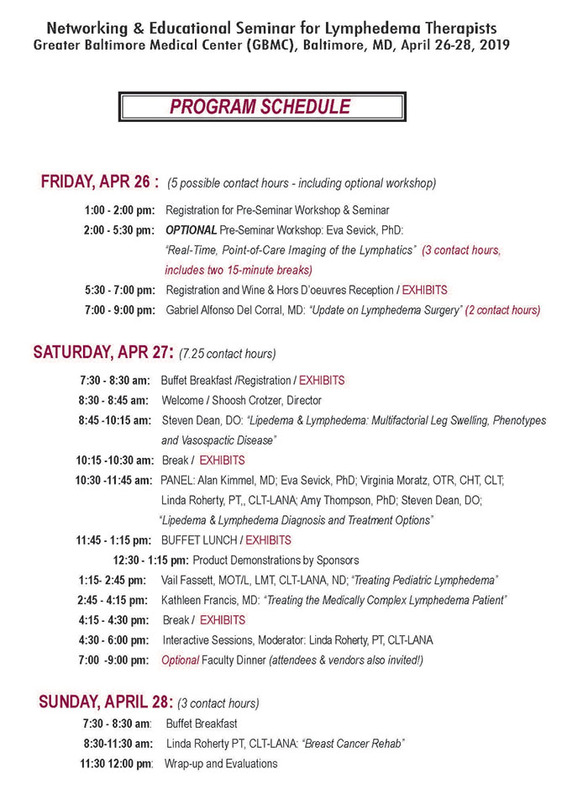 *** NOTE: There will be an OPTIONAL pre-seminar WORKSHOP on Friday, April 26, from 2:00-5:30 pm (3 contact hours) for an additional $99*, with EVA SEVICK, PhD: "Real-Time, Point-of-Care Imaging of the Lymphatics"
7:00-9:00 p.m.: Gabriel Alfonso Del Corral, MD: "Update on Lymphedema Surgery"
Call for Reservations and ask for the discounted Lymph Seminar rate of only $125/night! Gabriel Alfonso Del Corral, MD: "Update on Lymphedema Surgery"
Steven Dean, DO: "Lipedema & Lymphedema: Multifactorial Leg Swelling, Phenotypes, and Vasospastic Disease"
Vail Fassett, MOT/L, LMT, CLT-LANA, ND: "Treating Pediatric Lymphedema"
Kathleen Francis, MD: "Treating the Medically Complex Lymphedema Patient"
PANEL DISCUSSION: Alan Kimmel, MD; Eva Sevick, PhD; Virginia Moratz, OTR, CHT, CLT; Linda Roherty, PT, CLT-LANA; Amy Thompson, PhD; Steven Dean, DO; Kathleen Francis, MD: "Lipedema & Lymphedema Diagnosis and Treatment Options"
Lymphedema Seminars is an Approved Provider #8208 for Continuing Education by the American Occupational Therapy Association (AOTA). We are also applying for CEU approval from the Maryland Board of Physical Therapy Examiners. We provide Certificates of Completion to all attendees.